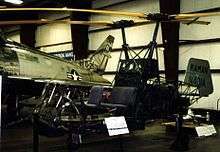 The Kaman K-225 was an experimental helicopter developed by Kaman Aircraft. 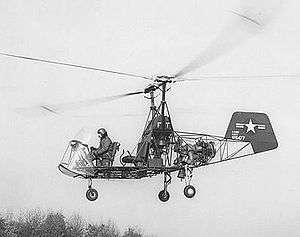 One was modified to become the world's first gas turbine-powered helicopter. A modified K-225 equipped with a Boeing 502 (YT50) turboshaft engine became the world's first gas turbine- powered helicopter in December 1951. This aircraft is now at the Smithsonian Institution in Washington, D.C.
United States Navy designation for two K-225s bought for evaluation. ↑ "Hall of Fame/Inventor Profile: Charles Kaman"
↑ Eckland, K.O. (2009-03-07). "American Airplane Ka-Ku". usa: Aerofiles.com. Retrieved 8 May 2012. "Hall of Fame/Inventor Profile: Charles Kaman". National Inventors Hall of Fame. Retrieved 2009-01-27. Wikimedia Commons has media related to Kaman K-225. Eckland, K.O. (2009-03-07). "American Airplane 1949 Popular Science article on Kaman K-190 and the blade intermesh technology developed by Kaman — ie rare photos Ka-Ku". usa: Aerofiles.com. Retrieved 8 May 2012. "New 'Copter Almost Flies Itself"